Make your home shine with our interior styling & full service design. Let Your Home Shine with HomeGlow Studio. Photography courtesy of Crystal Clear Photography. If you want to refresh and update your home, but are overwhelmed with interior decorating choices, we can create a cohesive and beautiful vision and make it come to life. Whether you need help with flooring, counter or paint choices, or are looking for a whole new design and floor plan for your home, we can help. We even provide 3D renderings to help you visualize your future space. When you make your home look its best before it hits the real estate market, you get the benefits of a potentially faster sale and higher sale price. We offer personalized DIY room-by-room styling advice and tips on how to polish the look of your home and make it appeal to buyers. Need help with choosing flooring, paint & fixtures for your new home? Let us help you make sense of all the choices and come up with an action plan that works with your tastes. Have us take a look at your home plans and start to work our magic. We offer home design services to homeowners near and far. We can design your favourite room, your main living areas or transform your entire home. For those closer to home, we provide on-site design and help with your construction project through completion. Please see below for some of our projects. Please click the pictures to see "before" images. All styling & design work by HomeGlow Studio. Our design studio is located in the beautiful Comox Valley, British Columbia. Most of our plans start with a sketch and brainstorming (pencil to paper) followed by a the creation of a 3D rendering, which brings the vision to life and allows us to play with textures and colours. We completely redesigned and renovated this former bedroom into the new home for our studio.In order to create value for resale or rental at a later date, we designed this so that the desk can be pulled out and replaced with a queen bed. The side tables then become night tables. Here you can see the original 3D rendering we created for this project prior to construction. Natural textures, aged brass & bold hits of black & white geo patterns make our new office a pleasure to work in. This luxurious master ensuite is the result of a lot of careful thought put towards aesthetics, function and safety; plus, careful attention to detail (down to the 1/32 of an inch) by all involved in this project (including our fabulous clients)! Thanks to my hubby Dustin Kneeland (Main Street Renovations), for triple thinking every move on this complicated install. 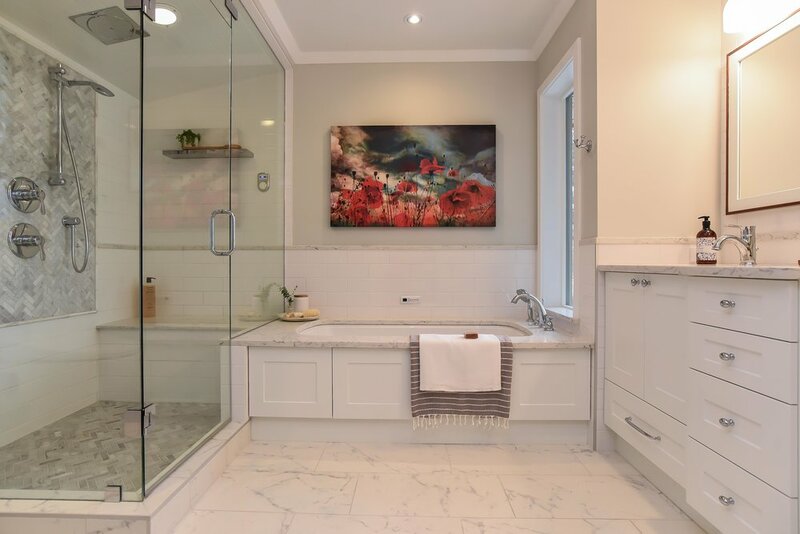 This luxurious bathroom includes an under mount quartz Bain Ultra tub with heated air flow and back rest, steam shower with heated floors and seat, heated towel rack, custom vanity, hidden storage cabinet behind artwork (thanks Charlie Mitchell), specialty lighting and more. Check out the before pictures here. This commercial health services building located on the waterfront in downtown Comox is currently undergoing a complete exterior transformation with the help our our design work. Keeping in mind the nautical theme and heritage style of other newer buildings in the downtown Comox core, we worked with our clients to add exterior design features that lent a more upscale craftsman look to the building. We are excited about this project which is currently in progress. See below for a before/after pictures. The Landing - Before Picture. In Progress - Decorative pieces in the peaks, boxwoods window boxes and a nautical colour scheme are transforming this downtown Comox Commercial building by giving it to a more upscale, craftsman style. More pictures to come! Crowne Isle Rancher Gets a Touch of Christmas Glam. We styled this home in Crowne Isle, which had been on the market for several months, for the charity Anderton Gardens Christmas Home Tour. Using some of the owners' furniture and some items brought in from local businesses, we created a warm, elegant Christmas style. The home sold shortly thereafter to some happy buyers. Special thanks to Bethany Van Hecke and Realtor Alice East for their help with this job. In the living room, we used the owner's existing leather recliner and glass table and brought in custom chosen couch and love seat, plus silver accent rug, throw pillows and Christmas decor courtesy of local providers. Fresh greenery, paired with a warm mini-lights and silver and black accents gave this home a refined Christmas glow. The owner's furniture lent to a "Hollywood Glam" style in the bedroom. Updated bedding & warm textures were added with a cosy throw and faux fur pillows. 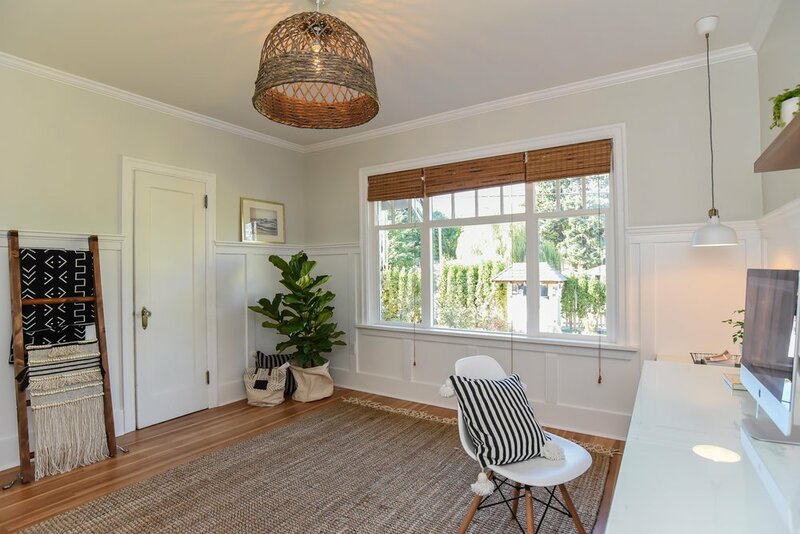 HomeGlow owner Sharleen & her husband Dustin, owner of Main Street Renovations, have been gradually transforming this iconic 1935 Courtenay property on 5th Street into a showcase for their work. When they purchased the home in 2009, it had knob and tube wiring, no insulation, years of wear & tear and just few updates since 1935. Today, it's a bright and airy space with an open floor plan and vintage farmhouse style. Classic French style landscaping & patio compliments the property and lends an air of opulence. White wainscotting and a vintage style pendant light brighten this formerly dark entrance, while a heated floor of polished slate tile adds comfort & style. In a sunny spot in the back yard, a previously empty space was replaced with a lavender filled French style potager (kitchen garden) to grow fresh organic veggies. With this kitchen design & renovation, the couple recycled the cabinets from the previously dysfunctional kitchen and installed refinished vintage exterior French doors to stay in budget. A touch of luxe was added with carrara marble counters and stainless appliances. 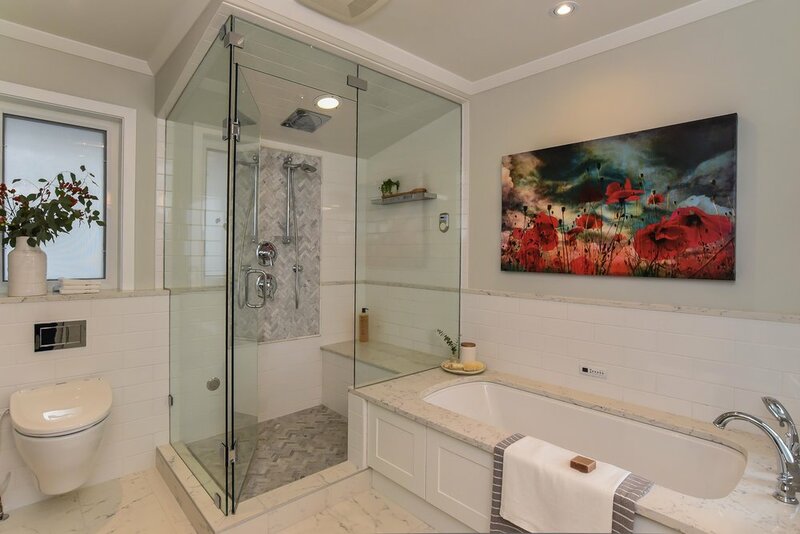 With this complete bathroom renovation, we designed everything from the ground up including the finishing selections, design of the custom tile mat on the heated floor and the inlay on the steam shower walls. A classic clawfoot tub adds vintage panache and wainscotting lends architectural interest. The existing clawfoot tub was refinished and a new faucet was installed to make this once neglected bath shine again. We designed this walk-in steam shower featuring heated marble slab seat, rainfall shower and custom tile inlays on floor and wall. When this circa 1948 home was purchased, the closed off floor plan, 1950s kitchen cabinets and white and green colour scheme made it feel dark and dated. We designed an open floor plan to create more flow and updated the home in an on-trend vintage inspired style that aligned with the character of the home and increased its appeal to young families moving into the neighbourhood. Finally, a fresh coat of dark burgundy exterior paint and some carefully chosen architectural features, combined with a little elbow grease, made this home sparkle. We transformed this formerly bare and dusty basement into warm and inviting luxury suite. High gloss tiles infuse added light into the space, while a recycled kitchen was added to save costs. Wood floors and an open plan make the space warm and inviting. This picture, taken before the suite was styled, shows the suite from almost the same angle as this before shot. Like what you see? To read more about us click here. HOMEGLOW IS A SERVICE OF WATERFRONT WEST REAL ESTATE.